Found a box of brand new 18650 Lithium Ion batteries today (see photo below). They are 2200 mAh 3.6v rechargeable batteries. I originally bought these 18650 batteries to rebuild notebook battery packs. But the notebook battery pack I was building at the time was an 11.1v LiIon battery pack. 11.1v divide by 3 is 3.7v. Needless to day, the 3.6v 18650 battery cells didn't work. So they had been sitting in my closet for a long time. 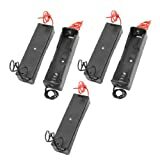 Maybe these batteries will work for airsoft, RC cars, or other fun hobbies. They are already being used in flashlights and notebook computer. It's time to put these dust-gathering 18650 rechargeable batteries to use. Right now, I've been obsessed with airsoft, so this thread will document my adventure down that path. Airsoft electric guns (AEG) typically uses 7.2v, 8.4v, 9.6v, and 11.1v batteries. Two of these 3.6v 18650 batteries in a series makes up 7.2v. Three of them makes up 10.8v, which is plenty of power for an AEG. If you put four of them in a series, you are up to 14.4v, which could drive many of your home power tools. Back when I have been building RC cars, I use to solder batteries together to make a battery pack. Nowadays, I'm a little lazy. Good news is that you can get 18650 battery holders, much like the AA holders that Radio Shack sells. 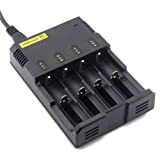 Amazon has 18650 battery holders that comes in single, double, triple, and quad configurations (see "Related Links" section below). Using different configuration, you can pretty much come up with different shapes. For example, you can glue a series of single 18650 battery holders together to make a stick battery for AEG. Or use a triple holder to use inside a PEQ battery box. This means that you'll have to pull each 18650 cell out of the battery holder to charge them. But I prefer it this way, because it's easy to get a 18650 smart charger on Amazon, rather than figuring out how to charge 18650 lithium ion battery pack and balancing them with your hobby charger. The Nitecore IntelliCharger i4 Battery Charger seems to be a good smart charger for this purpose (see "Related Links" section below). It charges up to four assorted NiCd, NiMH, and Lithium Ion batteries at the same time. It automatically shuts off as each battery is fully charged. I am going to order these parts and keep you posted on the progress. Sadly, my 18650 lithium ion batteries are unprotected. Therefore, this adventure just got a little more interesting as I figure out how I'm doing to deal with the voltage drop. Ok. I found the Charge/Discharge Protective Circuit Board for Rechargeable Li-Ion Batteries (17.4mm*1.9mm) on DealExtreme for $1.27 with free shipping (see "Related Links" section below). I think I'll get 10+ for $1.11 each. Using this protection circuit on each of the 18650 battery cells should save me from risks and headaches down the road. As I sat here, waiting for all the parts to arrive, I started looking at the maximum current the 18650 can supply. Searching around for "18650 data sheet", I found the TENERGY 18650 2200mAh Li-Ion Cell datasheet, which looked very similar to the 18650 battery cells that I have. Except the Tenergy battery is rated 3.7v, rather than 3.6v. I did another search for "18650 3.6v 2200mah data sheet", and found the Varta LIC 18650-22 FC datasheet. In both datasheets, the maximum continuous discharge is rated at 2C (4400mA). It is commonly agreed upon that high quality AEG draws up to 15, 20, or even 30 amps peak. So, it doesn't seem like 18650 batteries will be able to drive an AEG. On the other hand, LPEG probably draws much less and maybe 18650 batteries will work for those airsoft guns. It's hard to say without first hand information on how much peak current my guns draw. I guess I'll have to figure out a way to measure peak current draw on my guns. After an enjoyable holiday break, all of the parts I ordered have arrived. That includes the battery holders, the protective circuits, and the SmartCharger. It looks like a full month has passed. My next step is to wire up Tamiya connectors onto the battery holders for airsoft use. Stay tuned. It's been a good holiday. Now that things have settled down a bit, I have final results to report. First of all, I have wired up some Tamiya connectors to alligator clips. You can see how that's done in the "Make Your Own Tamiya and Mini Tamiya Adapter" article. Using the alligator clips, I could wire them up to the battery holders. In the future, I can also use these Tamiya adapters to connect to other battery sources for experimenting. After wiring them up, I connected them to appropriate 18650 battery holders--2 cell holder for 7.2v guns and 3 cell holders for 9.6v guns. I attempted to fire a HPEG and a LPEG. Unfortunately, neither fired. You can hear the gears clicking, but the 18650 batteries just doesn't provide enough current to pull the springs back. The lesson learned in this adventure is that the Lithium Ion batteries are designed for consumer electronics, which is generally constant current or very little current variation. Motorized devices, such as an airsoft gun, R/C car, or power tools requires batteries that can deliver high peak voltage and may not necessarily draw constant current. At this time, I don't have any real use for these 18650 batteries. I know there are flashlights that can use them. But that's pretty much it. Interesting read. thank you for this. I had been thinking about using these batteries to convert a Marui sopmod ebb rifle to lipo. Interesting read. I've been looking at doing the same, based on a number of NOS laptop batteries I grabbed at work. Inside (wretched job disassembling) they're LG non-protected 18650 3.7v 2600mAh. Got them charging at the moment (Intellicharger i4 here too!) so just need a battery box and a restock of Deans connectors and i'll (hopefully) be set. I found it interesting that your setup wouldn't fire. I have another (pre-made with balance cable) 3S 18650 pack (only 1500mAh) that was from a toy helicopter - that fires my G&G RK47 EBB perfectly, much crisper and a better ROF. Though, I haven't done a full "field test" yet to determine how long I get before voltage/current sag stops proceedings (or if the stock trigger can handle 11.1v for a decent amount of time). I need to look up the correct wiring for a balance plug - if only to hook up one of my LiPo alarms to keep an eye on cell health. Neil. It's good to hear that you have good results with these batteries and your airsoft guns. Maybe there is light at the end of the tunnel. Please keep us posted on your field test. I built a 3S battery pack for my AEG using 3 x Samsung 18650 25R 2500mAh batteries. The 25R's are rated at 20A continuous discharge. I also added a 3S balance connector for individual cell charging. The ROF/RPS was slightly higher than the 9.6 NiMh pack due to the 10.8V 18650 pack. Run time was over 50% longer due to the higher capacity. Super easy to build the battery pack. Oh awesome! I didn't know they have high discharge 18650's now. Thx for letting us know. I will keep the in mind next time I need a battery pack. Vapers are using such batteries, because their mods need high discharge too. Excerpt: I have several cordless power tools. They all use proprietary 7.2 volt batteries. The photo below shows two of my cordless power tools: a Black & Decker saw and a Skil drill. Each of these power tools comes with two 3.6v batteries (installs in series to make 7.2 volts). Although the batteries are ex . . .